Army Alphabet charts, letters, quiz games, test worksheets & study guides, call signs, abbreviations, acronyms, flash cards and free printables. Learn fun facts about the Army language and test your skills with our free test worksheets. Telephony - through vocal methods by speaking. Alpha for A, Bravo for B, Charlie for C, Delta for D, Echo for E, Foxtrot for F, Golf for G, Hotel for H, India for I, Juliet for J, Kilo for K, Lima for L, Mike for M, November for N, Oscar for O, Papa for P, Quebec for Q, Romeo for R, Sierra for S, Tango to T, Uniform for U, Victor for V, Whiskey for W, Xray for X, Yankee for Y and Zulu for Z. The letter names are created in such a way to prevent any confusion with other similar sounding alphabet letters. For a full list of pronunciations for each letter & sayings, please see the abbreviations page. Audio/Radio - by way of using the Morse code. ( Morse code allows people to pass text information through special tones, light signals and beeps / clicks known as "dits and dahs" through a special transmission device. Individuals skilled with interpreting Morse code can easily decode the signals received to read the message and understand the meaning. 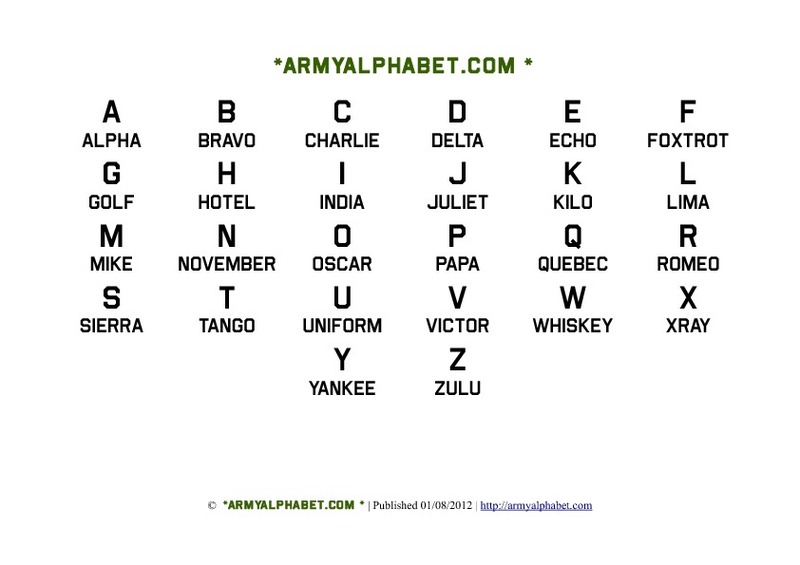 The entire Army Alphabet terminology is made of English words and letters, and allows letters and numbers to be transmitted for communication between parties. Although the alphabet has changed several times over the decades and old versions which were in effect prior and during WW2 / World War 2 in years 1913, 1927 and 1938, the present and official modern day phonetic alphabet was adopted in 1957 and is still being used today in it's current form. 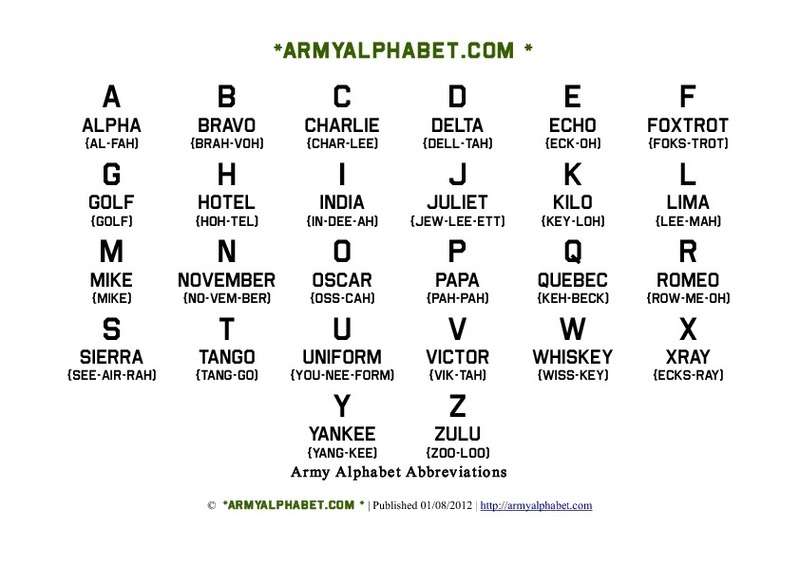 View and download The Army Phonetic alphabet chart which contains the full set of phonetic alphabets and designations for each letter in a table. Available in PDF format. The present day phonetic Army Alphabet is used by almost all Western countries such as Australia, NZ, Canada, The UK (British), United States and many others. It is also used by the National Guard and other important Government departments. Other countries such as Russia, China and others use different versions in their own languages. Army Alphabet book. Download our free book in printable pdf format which contains the full set of phonetic alphabets used by the Army. Print it for free. Printable test quizzes with answer sheets which will include "What does the letters mean", "Write the words in phonetic alphabet", "number quizzes", "spelling quiz", "word searches" and more! Our worksheets are available in PDF for free. Print our test worksheets and practice your skills with the Army Alphabet. All our test worksheets come with answer sheets. Army Alphabet Stencils to Print. These are printable alphabets with a common Army type font created in stencils to print. Army men alphabet - Create your own Army men with this cool font! 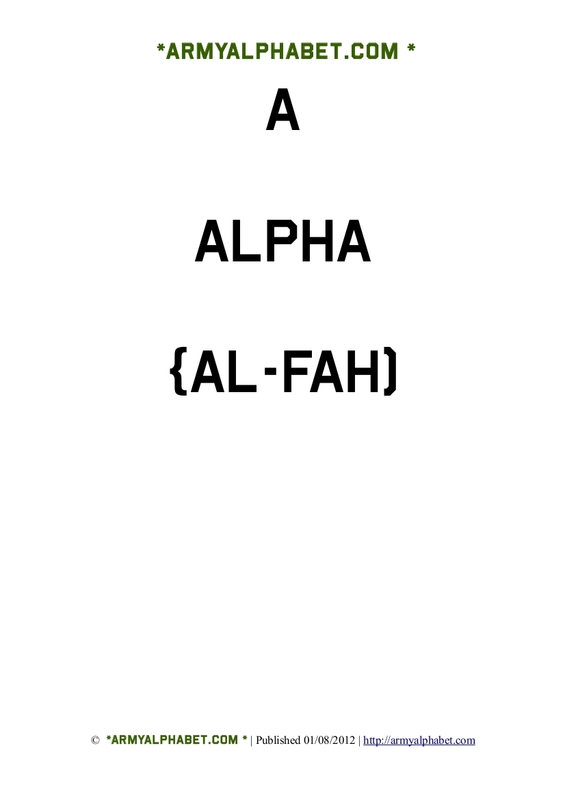 PDF document with Army alphabet letters, abbreviations and phonetics. This printable PDF document contains 26 pages of the army code letters and words. Great for study. You can download our PDF for free on this page. The army alphabet abbreviations viewed in table format. Also available in PDF printable format. Study the army alphabet abbreviations here and print out the free pdf sheet. These charts are in landscape A4 format and will print perfectly on A4 paper. Print our army alphabet charts for free on this page. 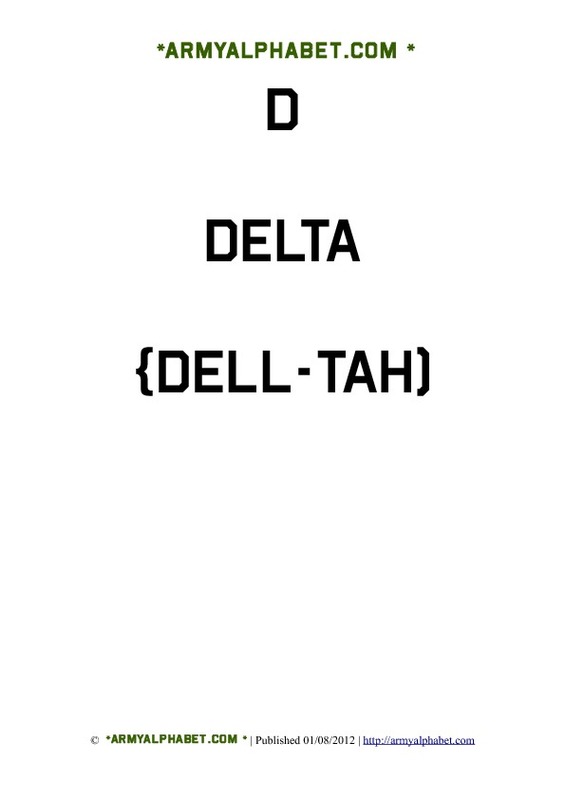 Download free army alphabet flash cards in jpg format. 26 flashcards with army alphabet jargon. Alpha, Bravo, Charlie, Delta ...... to Zulu. Copyright © Armyalphabet.com | All Rights Reserved.